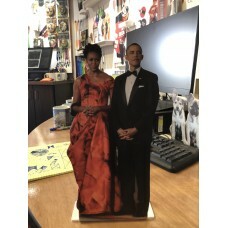 Shelf Buddies are digitally hd printed acrylic sheets, laser cut, reproductions of your favorite photo. Shelf buddies currently come in two sizes 8" and 12" being scaled to the larger dimension be it height or width. 8" Shelf Buddies are $36.95. While the larger 12" Shelf Buddies are generally $42.95. Custom Shelf Buddies are printed directly to 3/16th" acrylic using UV curing technology guaranteeing a perfect print. Shelf Buddies are then contour laser cut for smoothe edges ready for display. All Shelf Buddies come ready for display no assembly required. Standard production time is 5 business days.